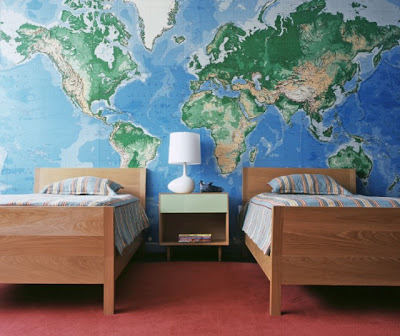 Over the past few weeks I have run into quite a few photos of rooms decorated with maps. (The image above is from Deco Peques). Some of the rooms are modern interpretations while others are more traditional. 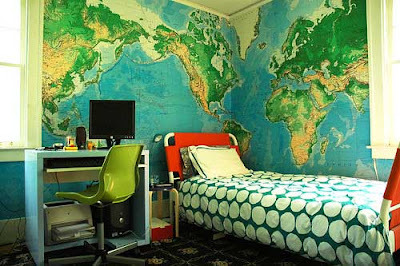 Either way, this is an easy way to inspire your child to learn about the world and can also help teach them how to read a map. 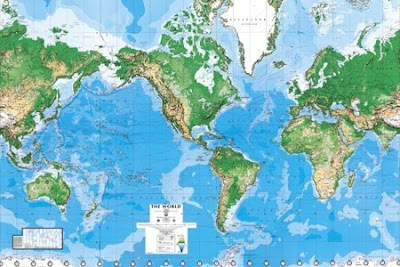 I hope the images inspire you to bring maps into your life. 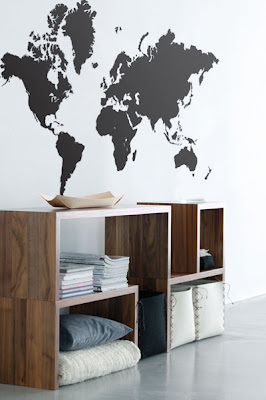 A temporary world map decal from Ferm Living. 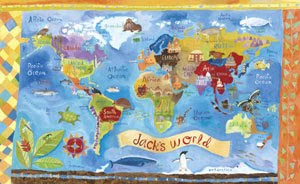 Our World stretched canvas artwork by Oopsy Daisy, one of our best sellers at Sprout. 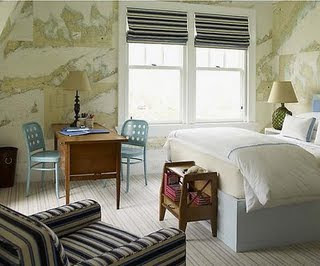 An image from Elle Decor Magazine. 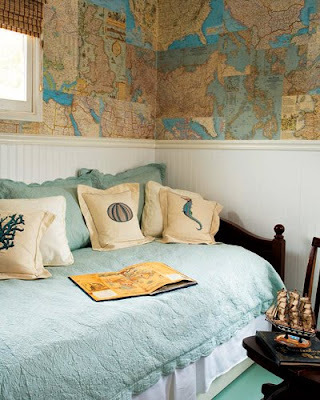 They used antique maps for this guest bedroom. A photo from a friend's bar in their home in Manchester, MA. 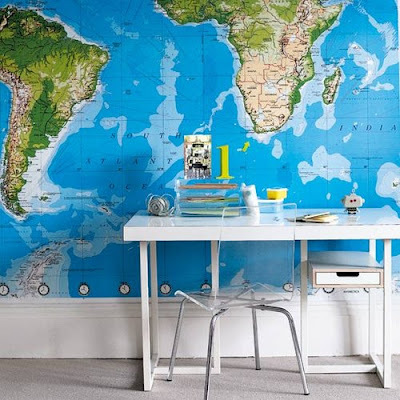 They used old charts as wall paper, I might actually do this in my hallway downstairs...hmmm. Thank you for commenting on my map inspiration post and giving me the link here. You have some great inspiration in this post too. 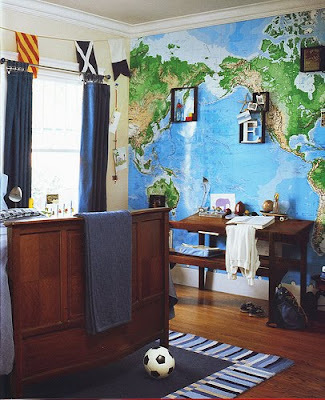 That Pottery Barn room would make such a fun kids room, wouldn't it? Love it. Love the post! 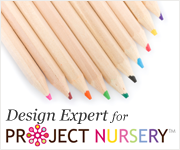 I am trying to decide which map to use in my nursery!! This unique are probably the virtually all well-liked picks from wiping out eyeball purses. It's been made use of in prada replica handbags not to mention caress parlors. But, getting cucumber for a big eyes might be comfortably undertaken your own house. You just prefer some slice from cucumber not to mention input it onto your vulnerable big eyes. Any time you have it again with freezer a better choice for coolness of this cucumber can really temporarily relieve some of those big eyes. Believe it or not, Green teas purses hold high levels of caffeine which are usually especially with good gucci replica handbags. Antioxidants are able to greatly reduce typically the puffiness of this big eyes not to mention eliminate the darkness sectors not to mention wrinkles below the big eyes. Presently, you can find emulsions now in the marketplace who expressly digs up to improve your epidermis to the big eyes. At the same time, such emulsions may well gucci replica belts through boosting wonderful facial lines not to mention wrinkles to the big eyes. Eyelastin, Eyevive, Revitalume, Dermalex-MD not to mention TNS Enlightening Eyeball Remedy are actually many the right services available on the market in these modern times. Families have got to snooze. Numerous is to pre-occupied who they really are in no way uncovering an adequate amount of snooze prada replica time of day. Nevertheless, make an attempt to relaxation utilizing your start to some degree lifted to minimize solution maintenance. Darkness sectors not to mention purses below the big eyes are actually displeasing. It may well get a particular turn up prada replica. To take out eyeball purses, glance at the tips and hints on top of.